The NRC will hold several meetings next week in Rockville, Md., with industry representatives to continue discussions on proposals for implementing recommendations from the NRC’s Japan Near-Term Task Force. The task force examined issues raised by the Fukushima nuclear accident in March. The meeting on Monday, Dec. 12, will discuss the recommendation that covers a plant’s staffing needs during a potential accident at multiple reactors on one site and communications needs if a nuclear power plant loses all A/C power. The meeting on Wednesday, Dec. 14, will discuss recommendations that call for re-examination of earthquake and flooding hazards at U.S. nuclear power plants. The staff will hold two meetings on Thursday, Dec. 15. The first will discuss the recommendation to require certain types of U.S. nuclear power plants to have reliable means of releasing pressure buildup during an accident. The second meeting will discuss the recommendation to require U.S. nuclear power plants to install additional equipment to monitor their spent fuel pools. Future meetings will be posted on the NRC website. The task force issued its report and recommendations on July 12. The Commission directed the staff to identify which recommendations could be implemented without unnecessary delay, and the staff responded with a proposal Sept. 9. The Commission provided direction to the staff Oct. 18 on how to carry out the proposal. 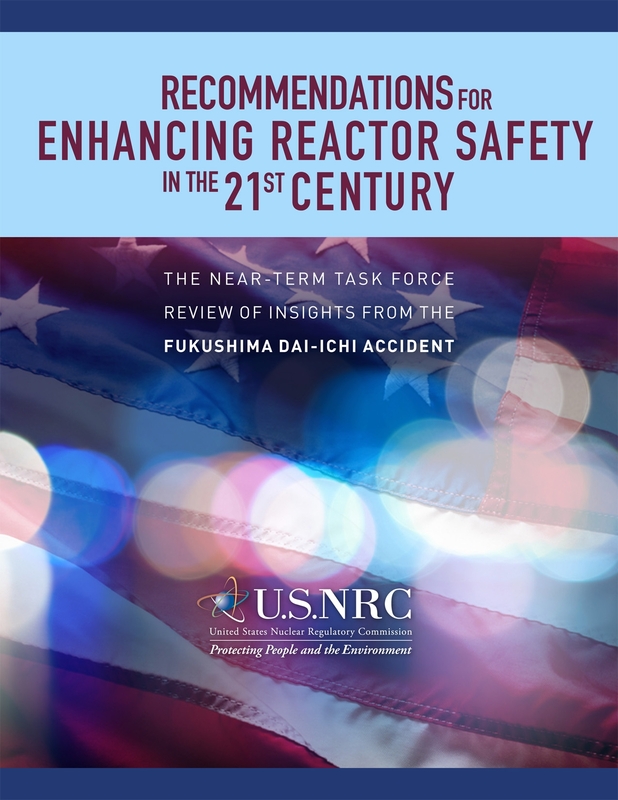 The NRC Task Force concluded that current U.S. nuclear power plants can continue to operate safely. The task force’s recommendations are meant to enhance the plants’ already-acceptable ability to deal with very unlikely severe natural events. The NRC continues to conclude U.S. reactors and spent fuel pools/dry casks have been designed and built to withstand the earthquakes possible at their sites. An ongoing joint effort between the NRC, Electric Power Research Institute and the Department of Energy, examining the most current understanding of Eastern and Central U.S. seismic information, is being incorporated into a similar task force recommendation. The NRC’s Office of Research also maintains close ties with the U.S. Geological Survey and other seismic experts to stay current on earthquake and tsunami science and information. I share some of these concerns. We have heard that 20% of the world’s nuclear power plants are located in areas at high risk of earthquakes. We have heard that Japan’s nuclear plants were mandated by law to be able to withstand at least an 8.2 quake, that Fukushima was actually built to withstand an 8.6 quake, what Japan got was a 9.2 quake. Now we know in recent history, the world has had at least a 9.5, with higher theoretically possible, but that most of Japan chaos was due to inadequate planning for how high a Tsunami might be, because planners decided to save money by not consulting Tsunami experts. So this begs the question of how severe an earthquake we might expect in USA in proximity to nuclear power plants, and whether they are built to withstand that, and if USA nuclear designers have in fact consulted the seismic and tsunami scientists. More importantly, these spent fuel need to be stored for hundreds of years, so it does not matter where they are stored, there will probably be an earthquake there, before the hundreds of years expire, so are they where no natural disaster will disrupt the containment? Also the seismic and tsunami scientists are constantly learning new stuff, which could have implications for nuclear safety. Have arrangements been made so NRC remains informed about new discoveries in seismic and tsunami sciences which could impact nuclear safety? 1. Japan took a hell of a beating from the Tsunami and the associated Fukushima and other nuclear power plant incidents. 2. Investigations have determined that a great many errors of judgement were made, by Japan government and Industry, that had they not been made, there would have been no nuclear power plant melt downs, and the death rate to the Japanese people, from the Tsunami, would have been much less. 3. The world is in shock. We had thought Japan was a world class nation, with best technology, and best thinking. If this can happen in Japan, is there a risk that similar errors in judgement have been made in our nation? This thinking has led to an evaluation of our own safeties, to see if there is room for any improvement thanks to lessons learned about the Japan disasters. 4. Yes, we have in fact found areas where our nation’s risks can be better mitigated. That is the purpose of implementing the lessons learned. What is the purpose of the implementing Japan Task Force recommendations?….. I am still very concerned that the Spent Fuel Pools are still the main storage, long term and short term, for the radioactive waste. With most of the Pools across the country full to near capacity when are the laws passed to store the waste going to be modified and implemented? I’m glad to hear that there are measures to enhance the safety of the spent fuel storage pools but it really is not a solution. What proposals are on the table to Permanently store nuclear waste? Next Next post: How did the NRC decide the shield building at Davis-Besse is safe?